Lately the DSiWare service has received several musical creation tools: Music On series has provided us with a means to play musical instruments on the go, and the excellent Rytmik titles have shown exactly how awesome creating tunes on your DSi can be. Well, now it's WiiWare's turn in the form of Mix Superstar. If you're a gamer with a creative side, there's never been a better time to be living a Nintendo life. Similar to Rytmik, the control scheme can feel a bit daunting at first. Once you get the hang of it, you'll be piecing together your own musical creations in no time. 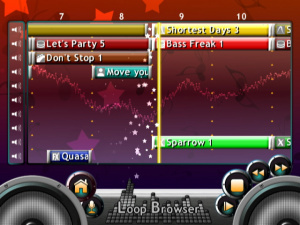 Most of the game is controlled by pointing with the Wii Remote while clicking and dragging loops onto a timeline, and you can shorten, lengthen, and layer the samples to create a full-length song. There are a thousand musical loops included across several instruments to mess around with, which makes the possibilities pretty much endless. As an added bonus, they are all royalty free. Yep, that means that you own your creations and can even profit from them! The first loop you lay down will determine the beats per minute of the track you are creating. As explained by the tutorial, loops with the same BPM sound better together. 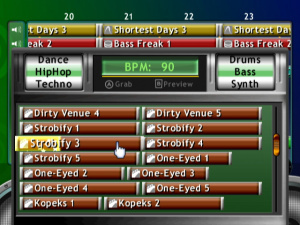 The samples are held in a menu that automatically pops up when you bring the cursor to the bottom of the screen. To delete a loop, you simply drag it to the top of the screen. The tracks are organized by the style of music and instrument in a very easy-to-use fashion. 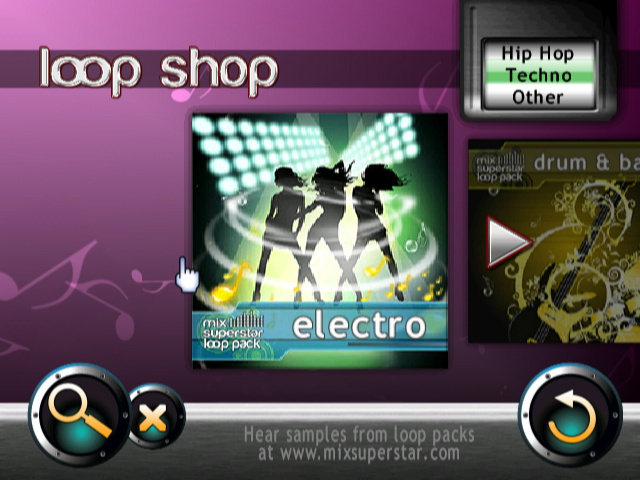 The game includes Dance, Hip Hop, and Techno loops, but features Nintendo Pay to Play support that allows you to download additional styles of music such as Pop and Trip Hop. 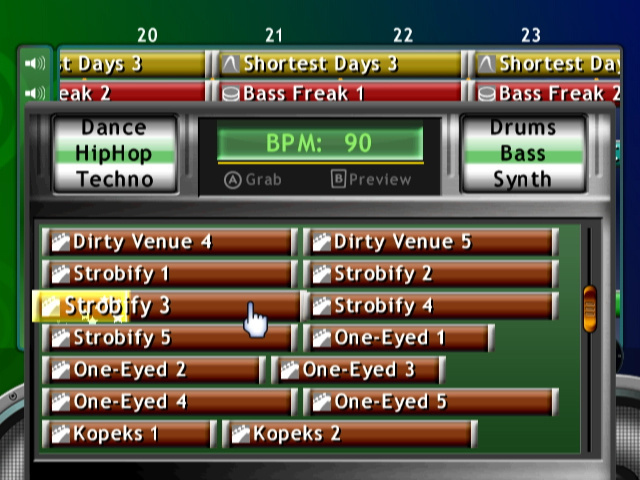 You can also download extra tracks for specific instruments like drums or bass. These download packs cost between 200 and 500 points and feature four to five hundred additional loops each. The excellent variety of included tracks will be enough for anyone to mess with for a good while, and the additional sample packs seem to be priced a bit high, but the additional content is there if you want it. This isn't the sort of title where you worry too much about the graphics, but don't worry, they're colourful and fun. On top of that, all the music sounds great. The female vocal tracks are particularly excellent. Whoever this lady is, she's an amazing singer. There's a nice variety of phrases too, ranging from a drawn out "yeah" to "do you really wanna touch me? Do you really wanna know me?". The male vocals are similarly excellent, but are limited to variations of catch phrases like "jam to the beat!" or "feel the rhythm!". Still, there's a decent selection to choose from that can add some masculine flavor to your music. The coolest feature in the game is definitely how easy it is to share your creations and put them on other devices. 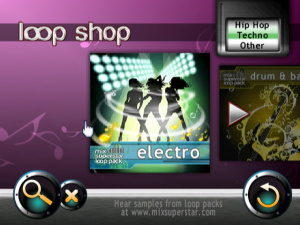 Once you save a song, you can simply hit the ever-present Export button to share it with a Wii friend or receive a code that allows you to download your creation as a .wav file from www.mixsuperstar.com. It's amazing how easy and quick it is. 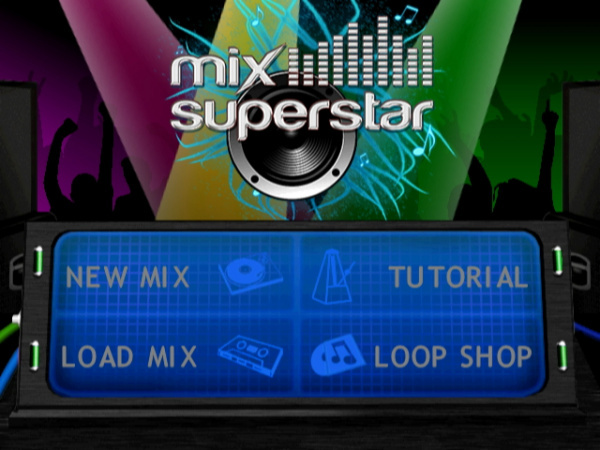 Mix Superstar also features mic support through Wii Speak or a Logitech USB Microphone to allow you to lay down your own vocals, which is like Miracle Gro for creativity. The self-recorded vocals come through loud and clear, and you can layer them with the sample vocals or any other loop. If you're a music game lover, this title is definitely a strong choice for you. The great variety of loops can lead to hours of fun for the musically inclined, and even draw in a casual musician to playing around for awhile. This is a strong application that delivers on all it's promises. Considering the samples are royalty free and easy to share, it's a steal for 500 points. Well, I will definately be getting this next time I'm home (over Thanksgiving break.) Cant wait to make some jams. Wow, cool. Nice review, the screenshots make the game look a bit ugly but if it's as good as you say it is then that kind of thing doesn't really matter. I knew it'd be good! Nice review! I enjoyed this app very much! The DLC, online exporting, and Wii Speak/Mic recording shows that the developer really wanted to make this a great product. Awesome job Digital Leisure! Glad to hear it's good. Can't wait for it to hit the EU stores. Dang. What a pleasantly unexpected score. For 500 points I feel kind of like a fool for waiting even this long. EDIT: It also makes me wish Wii Music had such a simple export function. This sounds great. Very nice. As Expected, it's similar to MUSIC on the PSX and eJay on the PC. Hope to see it land in euroland sooner trather then later, would be interesting to see what I could with it. Hmm... I've never been a fan of loop-based music creation, but at least it appears that they created a decent package. My kids are gonna love this (when it hits Aus/NZ - hopefully this friday seeing as we got no wiiware or demos last week). Looking at the game's website, I see a bunch of loop packs - does anyone know how these work? Do you buy them from the site using your PC and copy them to SD card and stick it in the Wii? Is it strictly loop stuff? Can you import own samples or create own sounds. How about sequencer? @jp- no, there's an in-game store that you buy stuff directly through, same as other WW games with DLC. Theres 9 packs out/coming soon from what I remember, going for 200-500 points each with a couple hundred new loops/whatever in each. Is this quicker and easier than computer based trackers like acid? I've used those before but haven't used them in a while. This is definitely cheaper but if you can't use your own loops might not want it. I like to make my own synth lines and drum loops and such. 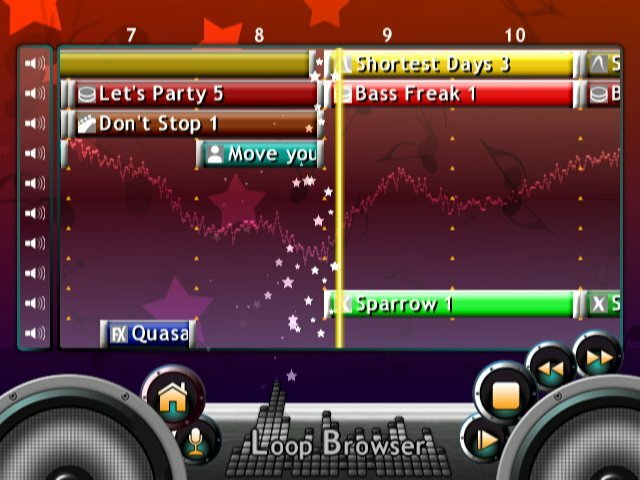 Still really cool that there is a cheap fairly easy to music editor like this that any of the many wii owners can use. @Objection_Blaster - thank you, sounds great! I completely skipped that paragraph in the review, sorry. @jbrodack - seeing you can import vocals using the USB microphone, you should be able to get custom samples in that way - though not as good quality going via the mic as a direct import, it is a workable solution. Can you get the ability to make rock and metal music via DLC? Wow, sounds extremely versatile. Kinda like a Wii version of GarageBand. You have to layer the vocals by manipulating the volume of the other loops. When you record with the mic, you're just laying down your own vocals over a completed mix. With some practice and good timing it can work really well. It's a little tricky but not too bad. There's no way to import your own loops as far as I can tell. I'm still playing the heck out of this! If it gets a 9 out of 10 that means its awesome!! But i still wont buy it. I just picked this up yesterday. I'm quite impressed with what it can achieve and how (relatively) easy to navigate its interface is, but it is hot-wired with one major snag. The Wii's lack of internal memory. The base game itself is 320 blocks. DLC can range up to 130 blocks EACH from what I have downloaded so far (two packs). Prospective buyers, if you decide to get this, do yourself a huge favor. Buy a dedicated SD card to hold it and your DLC when you're not using them. I might get this. It sounds great! There isn't much WW that I want. So, this is almost novelty for me. Not really a musician, but the amount of things one person can do with this game, at a discount price to boot, is nice to see. Good Review. Mix Superstar is really an apt name, it isn't designed for you to compose fully original masterpieces like the Rytmik series on DsiWare, but the ability to add your own voice into something you just mixed up makes the music seem that much more personal than the aforementioned game. Without lyrics, the best you can hope for is someone to hum or whistle your music. I want people to rock out with me and wonder what I'm smoking, and thanks to this tool, people CAN! I LOVE this game!!! Nintendo, thank you for demo's! I wasn't sure about buying this game, but after playing the demo, my brother and I immediatly went to the shop. Too bad I don't own wii speak or Logitec USB microphone. Just got around to playing the demo, and now I'm seriously thinking about getting this Luckily for me it seems to be amazing. Does anyone have the ticket code for this?